THERM-O-TYPE foil cutter cuts rolls up to 1000' in length. 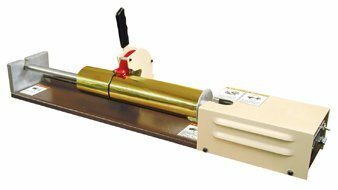 THERM-O-TYPE Electric Foil Cutter can handle rolls up to 1,000 feet in length. Rolls of foil are slipped over a steel shaft with a soft aluminum cover. A locking mechanism grips the inside of the roll core. A large circular blade, mounted on a handle, can be positioned along a support shaft and secured in position for the correct cut off length. Starting the electric motor, and simply lowering the blade handle, accurately and cleanly cuts through the foil and supporting core. Foil is produced in 24-inch wide rolls. 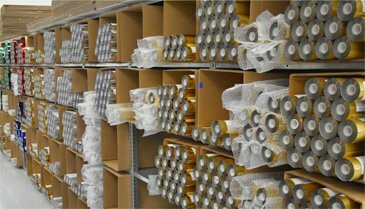 Although you can usually purchase rolls from a foil supplier cut in any width for a small additional charge. Foil stamping without a foil cutter is like operating a print shop without a paper cutter. The THERM-O-TYPE Foil Cutter is an inexpensive must if you do foil stamping and will pay for itself in short order.